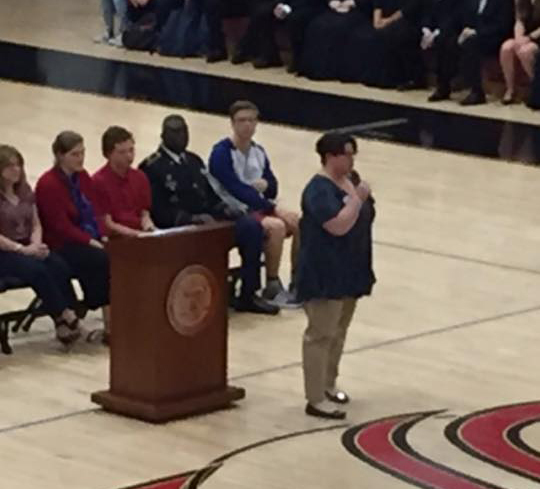 Specialist Tammy Johnson addresses the student body about her experiences in Desert Shield. The history club hosted its annual Veterans Day assembly for the student body. With Veterans Day falling on the tenth, it is important for the students to understand why they were missing school that day. The assembly commemorated the sacrifices of three veterans. Henry Hovezak, a World War I veteran, Tammy Johnson and even the school’s very own First Sergeant Walter Jones. The choir department welcomed the assembly with the singing of the national anthem while a slideshow of all veterans or active members that had family throughout the school played. Midway through they recognized each branch of the military with a piece titled “Salute to the Armed Forces” arranged by Camp Kirkland. Specialist Tammy Johnson, being the speaker of the day, shared stories of the time she spent in the military. Gaining her love for the freedom of her country in JROTC, Johnson enlisted right after graduating high school. Johnson discussed the trials she went through in the military. Such as carrying equipment that weighed almost as much as her only to teach a lesson. Johnson also told the time of when she was mistaken for a boy named “Tommy” and was sent on an infantry with all guys. The assembly was ended by the playing of “Taps” by sophomore Samuel Wilson. This served as remembrance of all fallen soldiers. “We are so honored that we can do this to honor our veterans,” Coggins said. Ania's the best, forget the rest.